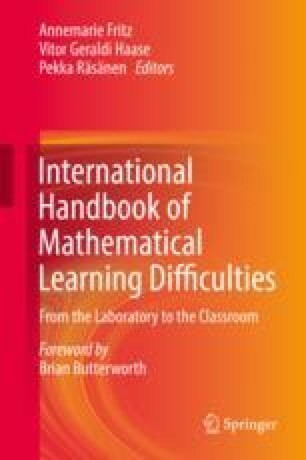 This chapter reviews current perspectives on math learning difficulties in Australia. It presents an overview of Australia’s math performance ranking on several international indices. It describes state-by-state differences in definitions of MLD, assessment approaches, and support offered to students with MLD. Furthermore, it describes limitations in many professional training programs in facilitating an understanding of MLD and dyscalculia and highlights cases where professional training is based on contemporary educational neuroscience research. The chapter reviews state-by-state math curricula and suggests they tend to be more pragmatic than informed by theory. Insofar as theory is articulated, it is usually in the context of Piagetian or Vygotskian theory, rather than contemporary educational neuroscience. Moreover, many teaching practices recommended in curricula documents are arguably aligned with embodied cognition theory, although this is not mentioned in the documents. It is noted that some best practice training programs are aware of the DSM-V’s definition of specific learning disabilities and dyscalculia, as well as contemporary research on MLD. The chapter concludes with a review of recent Australian math neurocognition research that is slowly being incorporated into math educational practice. Australian Curriculum, Assessment and Reporting Authority. (2013). National Assessment Program Literacy and numeracy. http://www.nap.edu.au/_resources/NAPLAN_2013_National_Report.